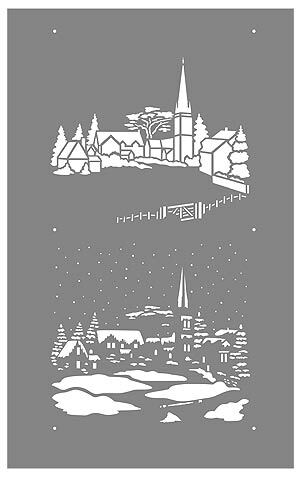 The Little Snowy Scene Stencil – depicts a tiny village scene in winter snow, with miniature houses, church and snow laden trees – the perfect Christmas stencil! 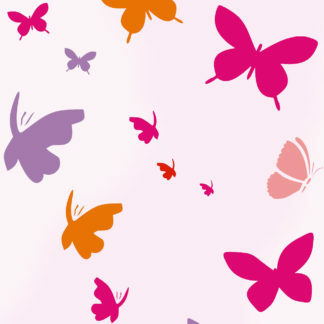 Ideal for creating gift cards and gift boxes. 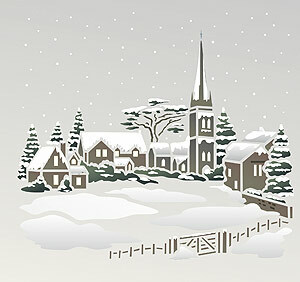 The Little Snowy Scene Stencil comes with helpful registrations dots for aligning both layers. 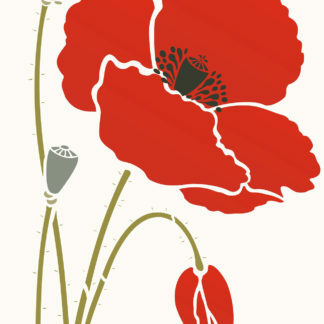 See size specifications below. 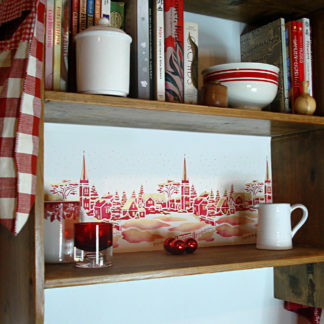 See our larger version of this design the new Snowy Scene Stencil. 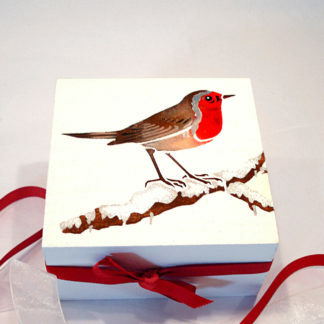 Above and top – create this stunning gift box with the Little Snowy Scene Stencil. 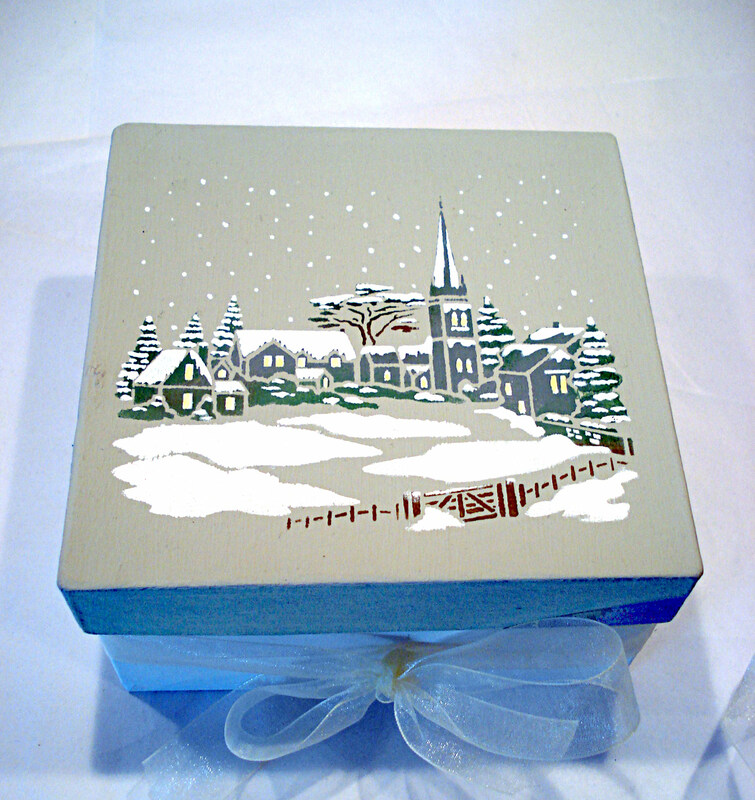 Here the lid of our box has been painted in Shoreline Stencil Paint and then stencilled in Arctic Grey, Eucalyptus, Woodland, Chocolat Stencil Paints (layer one buildings and trees) and Ice White and Evening Primrose Stencil Paints (layer two snow and windows). 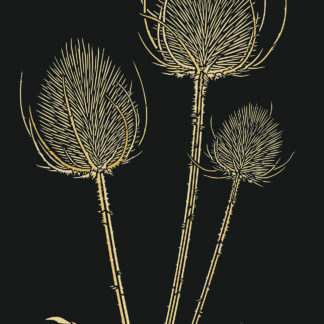 Use our Sable Brush Set for picking out the tiny details. 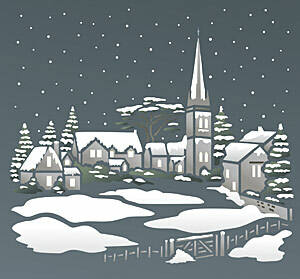 Above – the Little Snowy Scene Stencil shown in Storm and Eucalyptus Stencil Paints (layer one) and Ice White Stencil Paint (layer 2) on a dark grey background. 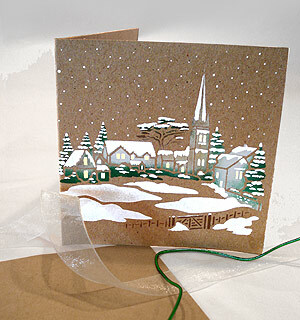 Above – the Little Snowy Scene Stencil will allow you to create beautiful minute scenes on cards, gift boxes, wrapping and more. 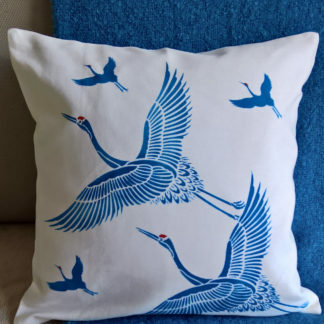 Shown here in Arctic Grey, Eucalyptus Stencil Paints (buildings and trees layer one) and Ice White Stencil Paint (layer two) on a midnight sky background. 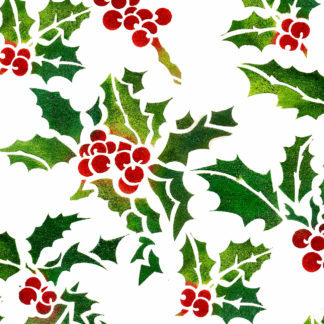 Above – close up detail of the Little Snowy Scene Stencil gift card. 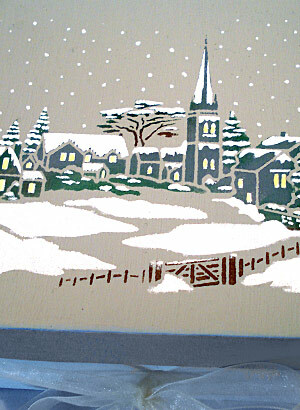 Above – the Little Snowy Scene Stencil shown in Arctic Grey, Mocha, Emerald Green Stencil Paints (layer one) and Ice White Stencil Paint (layer two) on a pale grey background. 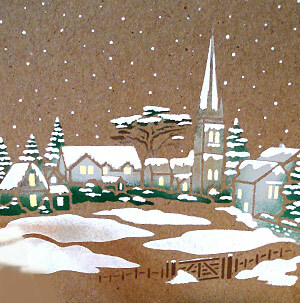 The Little Snowy Scene Stencil is a one sheet two layer stencil with registration dots for ease of alignment of the two layers. 125 micron Mylar. With full usage instructions. The Snowy Scene Motif measures approximately 13.2cm/5.25″ wide x 11cm/4.25″ tall. The church and spire is up to 7cm/2.75″ tall. 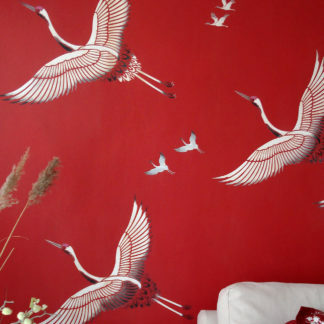 Sheet size 30.5cm/12″ tall by 20cm/8″ wide. 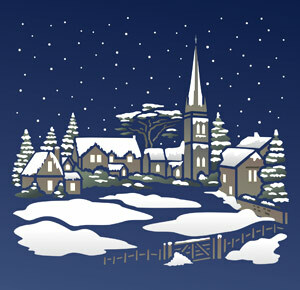 left – the Little Snowy Scene Stencil sheet showing the layout of both layers and registration dots.